Meet Rosemin, she participated in the 'BetterPoints- Greenwich' residents rewards programme after being recommended to join by her nephew. She is very passionate about cycling, even in busy South London she breaks down common barriers to cycling and feels a lot younger for it. When I was a young girl I cycled regularly. But a few years ago I got hit by a bus and my bike was off the road for a while. But as the saying goes once you get back on a bike you never forget. I love the freedom it gives me and helps me commute to places where there is no public transport. It also helps to keep me feeling young and healthy. I feel much healthier and younger than other 50-year olds I know. How has using the BetterPoints app helped you? Since my accident it has helped me get back to cycling regularly. What do you plan to spend your BetterPoints on? I will use them for shopping and buying treats for my kids. I encourage my whole family to use the BetterPoints app. The aim of the Greenwich residents programme was to encourage people to switch from cars to walking and cycling to help improve the air quality in the Greenwich Low Emissions Neighbourhood. The programme ran from August 2017 to December 2018. 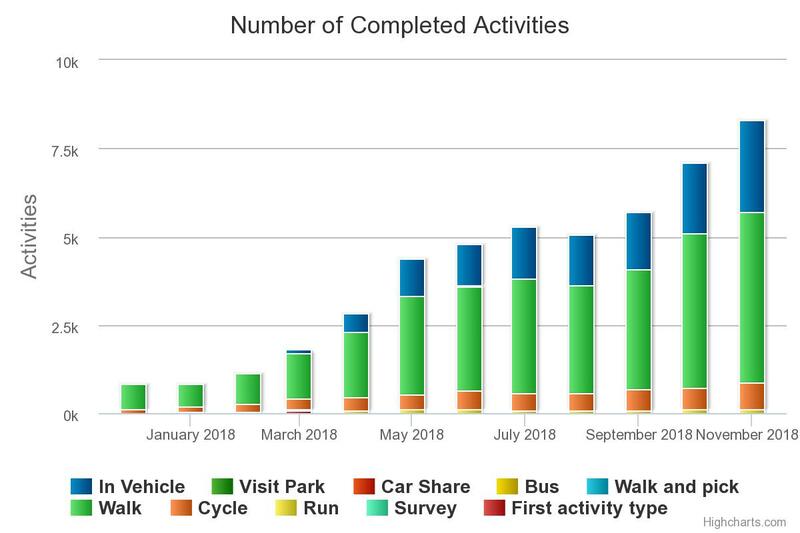 Throughout the programme a total 58,085 activities were recorded by the users, and 15,566 within the Low Emission Neighbourhood. Here is a graph showing you just some of the activity logged by Greenwich programme users during the programme. N.B. Walk and pick is an activity rewarded in the Ealing Love your park programme. BetterPoints users are fully aware that more active travel has multiple benefits: it can reduce air pollution, by reducing emissions and helps with urban noise. But most of all, more active travel can help people to get more exercise into their everyday lives, and yield huge health benefits as a consequence.